How can LinkMachine help my website or online business? 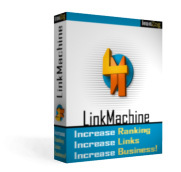 How can LinkMachine help to increase my Google PageRank? How can LinkMachine help to increase my ranking in other search engines? How is this different from 'link farms'? Will search engines mind if my link pages are generated by a program? Is LinkMachine search engine friendly? Can I use LinkMachine on more than one website? What do I do with my site's existing link pages? Can LinkMachine be used to send spam? My site is created using FrontPage. Can I use LinkMachine with this site? The instructions for installing LinkMachine require setting the chmod permissions on my site's "linkmachine" directory to 777. Does that present a security risk? I've installed LinkMachine on my web site, but when I run the script linkmachine.php, I am presented with a page full of nonsense text that begins with a copyright notice. What is wrong? I use LinkMachine on one site, and I'd like to use it on a second site as well. How do I do this? When I attempt to use LinkMachine I receive an error message, "Please make sure that your site's 'linkmachine' directory has all write permissions set to true, then try again." What should I do? How can I direct my visitors to a page where they can request a link exchange with my site? I've created a custom template for my link pages. This template page has several images on it. However on the link pages that are generated based on the template, these images are broken and do not display. What's wrong? When I try to upload a page template file to LinkMachine, I get an error message saying "Invalid template filename". What's wrong? How can I back up my site's LinkMachine link data? All of my link pages include a link at the bottom, "Powered by LinkMachine". Can I get rid of this link? Immediately after logging in to LinkMachine, I am logged out, and asked to log in again. Why? I've sent out some link exchange invitation e-mails - but the edit link included in these e-mails doesn't work. This is the link specified by %EDITURL% in the e-mail template. What's wrong? I've had LinkMachine check for reciprocal links, and there's one site that definitely does have a link back to my site, but LinkMachine set its status to Link-back missing anyway. Why isn't LinkMachine recognizing this reciprocal link? What if you go out of business? Will my copy of LinkMachine still work? Under Site Settings, what should I enter as the title of my site? I need to add a link from my home page to my link directory so that visitors and search engines can find it. But, I don't know how to add a link to a web page. What should I do? My site has many links pointing to it, but its Google PageRank is still zero. What's wrong? I would like each page in my link directory to have a page title and meta tags that are relevant to the category of links on that particular page. How can I do this with LinkMachine? I would like my link page to be located in my site's root directory, and use a different filename. Is that possible? LinkMachine takes the hard work out of creating and maintaining reciprocal link exchanges. A reciprocal link exchange is simply when another web site posts a link to your site, and in return you post a link to theirs. The most popular search engines all consider a site's link popularity as a major factor in determining how high that site will rank in their search results. The most effective way to increase your site's search engine ranking is therefore to get a large number of high quality, relevant web sites to post links to your site. Webmasters like exchanging reciprocal links with other relevent, high quality site, because both sites stand to benefit. LinkMachine makes it very easy to find any number of high quality sites that are relevent to your own site, and invite the webmasters of these sites to exchange links with your site. LinkMachine also allows anyone who visits your site to submit a link invitation to you - you can then accept or decline the invitation with a single click. And with LinkMachine Premium, you can instantly exchange links with other LinkMachine users, helping you to quickly build up a strong reciprocal link exchange directory. Reciprocal links lead to more visitors and higher search engine rankings, which lead to even more highly targeted visitors to your site who are interested in what you're saying or selling. Google's PageRank system is their way of trying to measure the importance of each web site. Sites with higher PageRank will tend to rank higher in search results, and so receive more visitors from Google. Since Google is the most popular search engine, raising your website's Google PageRank can be instrumental toward increasing the number of visitors your site receives. The most important factors Google uses to determine a site's PageRank are the number of links pointing to that site, and the PageRanks of the pages that those links are on. So the more links there are leading to your site from other relevant, quality web sites, the higher your PageRank will grow. Inviting other webmasters to exchange reciprocal links is an effective way to gain more links to your site, because both of your sites benefit from the exchange. All of the most popular search engines, including Google, Yahoo!, and MSN, factor link popularity into their search ranking. And several other search engines take their results from one of these big three. So establishing an effective reciprocal link exchange program can increase your ranking in all of the most popular search engines. Link farms are sites that are set up to contain massive numbers of links to other sites, in hopes of raising the search rankings of the sites they link to. This doesn't work - in fact link farms can now have the result of lowering the search rankings of the sites they link to, because search engines penalize sites that try to use those kinds of tricks. Personalized link exchanges like those set up with LinkMachine are very different - they are completely search engine friendly. A link exchange is a legitimate agreement between two webmasters to exchange quality, relevant links with one another. These are the kinds of links that make the web as useful as it is, and search engines take these links to your site as confirmations of its quality. LinkMachine generates your link pages as static HTML pages, just like the rest of your site. These pages may as well have been created by hand, from the search engine's point of view. A search engine finds LinkMachine's generated link pages just as easy to crawl and index as hand-coded pages. There are two aspects to this. The first aspect is whether search engines will respond well to the link pages that LinkMachine generates. The link pages LinkMachine generates are indistinguishable from hand crafted pages, from the search engine's point of view. They're seen as directories of high quality, relevant links. The second aspect is the method used by LinkMachine to generate its link pages. LinkMachine queries the Google search engine to look for relevant sites for you to exchange links with. LinkMachine allows you to enter a Google Web API key (which you can obtain from Google for free) so that it can query Google's search engine in full complaince with Google's terms of service. LinkMachine will still work just as well without a Google Web API key, but will not be complying with Google's rule against automated querying. This rule has been enforced rarely and only against sites bogging down Goggle with thousands of automated queries. LinkMachine makes only a handful of queries in comparison, but if this concerns you, you can easily obtain a free Google Web API key and have LinkMachine use that. Yes. When you purchase LinkMachine, you are licensed to use it on up to three different websites. Additional website licenses costs $10 for one license, or $200 for a block of 50 licenses. You can quickly import the links on any link pages you already have, into LinkMachine. No. LinkMachine makes it easy to send personalized e-mails to the webmasters of sites that you'd like to exchange links with. Most webmasters welcome link exchange invitations from quality, relevant websites. LinkMachine cannot be used to send bulk e-mail. Yes you can. If you're using FrontPage we recommend that you install LinkMachine using the online installer, or else by downloading the installation file and then uploading it to your site using an FTP program, rather than using FrontPage. Setting the directory's permissions to 777 allows the LinkMachine script to write to files inside that directory. This doesn't allow anyone to upload files to your site, or change files on your site, without their having your FTP login information. Permissions set to 777 is a security risk when there is a script on the site that can be used to upload a file to the site. Hackers could take advantage of this to upload a malicious script to the site. However, LinkMachine does not allow visitors to upload any files to the site, so it doesn't provide any opportunity for a hacker to place a malicious script on your site. What you are seeing is the LinkMachine script itself. The problem appears to be that your web server does not support Php scripts. So rather than running the script, it is simply showing you the script as text. Unfortunately the only way to get LinkMachine working on your site would be to move your site to a web host that does support Php. The majority of hosts do support Php - a couple that I recommend are Carpathia and 1&1. First install LinkMachine on your second site, using either the installtion script or the online installer. When you run LinkMachine on your second site for the first time, do not create a new account; instead, log in using the same e-mail and password as you use on your first site. LinkMachine will then associate the two sites with the same account. If you have upgraded (or will upgrade) your account to LinkMachine Premium, that upgrade will be applied to both sites. Using an ftp program, change the permissions on your site's linkmachine directory so that all of the read, write, and execute permissions are set to true. In some ftp programs, this feature is called chmod. If you don't know how to change a directory's permissions, refer to your ftp program's documentation. If after doing this you still receive the same error message, use your ftp program to delete the file lm.php inside of your site's linkmachine directory. LinkMachine generates a page with a form that your site's visitors can use to submit information about their site and request a link exchange. The file for this page is called exchange_links.html, and it is placed in the same directory where you have LinkMachine generate your link pages. You can link to this page from anywhere on your site to give visitors an opportunity to request a link exchange. By default, each link page that LinkMachine generates includes an "Add Link" link at the bottom. This link leads to the link submission page. The image links in an HTML file can be relative to the location of the web page file itself. For instance, the image link "images/logo.gif" will refer to an image file located in a directory called images that is below the directory where the web page file is located. Of course this means that if the web page file is moved, the link to the image will no longer be valid. The simplest way to solve this problem is to specify all of the image links in your template file as absolute paths, that is the full URL of the image. For the above example, that would be something like "http://mysite.com/images/logo.gif". Another way to solve this problem is to make sure that the image files are located in the correct directory relative to the directory where your link page files are generated. So in this example, you'd want to make sure that inside of your link page directory, there is a subdirectory named "images" that has the file "logo.gif" inside of it. Most likely this means that your web server doesn't support Php's file upload feature. To get around this, simply use an FTP client to upload your page template file into LinkMachine's "templates" directory on your site. The path for this directory is "linkmachine/templates" (unless you gave LinkMachine's directory a name other than "linkmachine"). Once you've uploaded the template file into the "templates" directory, your template should be available from the pop-down template menus on the Link Page Format settings page. Under Change Settings >> Backup Data, click on the link titled Click Here to Download LinkMachine Data. If the encrypted data file is displayed in your browser rather than being downloaded to your computer, then instead try right-clicking on the link, and choose Save target as... or Save link as... from the pop-up menu. You will then be able to save your link data file (linkmachine.dat) to your own computer as a backup. You can also download your link data in a readable form, as a .csv file. This type of file can be opened as a spreadsheet in Excel and other similar programs. Under Change Settings >> Backup Data, click on the link titled Click Here to Download Link Data as .csv File. The free Basic version of LinkMachine adds this link to all of the link pages it generates. This link, which brings more people to the LinkMachine site, is all we ask in return for your use of the free software. You can remove this link from your link pages by upgrading to LinkMachine Premium. LinkMachine uses browser cookies to keep track of whether you are logged in. First, make sure your web browser's cookie support is enabled. Next, make sure that your own computer's system clock is correct - especially the month and year. Finally, it's very rare but sometimes the system clock on the site's web server may be incorrect. Under Change Settings >> Site Settings, near the bottom of the page is a checkbox labeled Site Supports HTTP Local Access. Read the information below this checkbox and click on the test link. If the test shows that your web server does not support http local access, check the checkbox and click Submit Changes. Your %EDITURL% links should now work correctly. 1) LinkMachine checks each site for its reciprocal link on the page specified by the Reciprocal Link URL for that site. Does that URL point to the page where the reciprocal link is placed? 2) Is the reciprocal link valid? Does it contain your site's URL as you specified it in LinkMachine's Site Settings, and is it spelled correctly? 3) Is the reciprocal link a direct link to your site? Right click on the reciprocal link and choose Properties. If the link is indirect - for instance if it points to a script on that other site rather than directly to your site, then LinkMachine has no way of recognizing this as a link to your site. (Neither do the search engines, so this link will not help your search rankings either). If you'd like to continue to link to this site, you can set the site's status to One way link. 4) If the reciprocal link is in a frame or an iframe, set the Reciprocal Link URL for that site to the address of that frame itself, not the address of the frameset that it is within. 5) Finally, some web pages are configured to disallow access by automated scripts such as LinkMachine. To determine whether the page containing the reciprocal link cannot be viewed by LinkMachine for this reason, go to this page; enter the URL of the page with the reciprocal link and click Load Page. If the page with the reciprocal link does not appear, then LinkMachine is not being allowed to view that page. You could contact the webmaster of that site to try to resolve the problem, or set the site's status to One way link so that LinkMachine will not check it for a reciprocal link. Yes. If we go out of business and the central LinkMachine server goes down, the only difference from your point of view would be that you could no longer exchange InstantLinks with other LinkMachine users. That is because the InstantLinks feature uses the central database to connect users. However, LinkMachine would continue to work fine in every other way. This has been tested under real world conditions, while the central server was down for maintenance. The title that you enter under Site Settings is very important - it will be used as the anchor text for most of the links to your site. Search engines give great importance to anchor text. If you want to rank high in searches for "flower pots", for example, you should include the keywords "flower pots" in your Site Title. However, overly generic anchor text that's just made up of a collection of keyword can be considered spam. So it's advisable to include the name of your site or business in your Site Title. For example, "Garden Glory Flower Pots". NextEdit is a simple online web page editor that doesn't require any knowledge of html. You can try out NextEdit for free, and use it to very easily add the link to your home page. Google used to update the PageRanks that appear in the Google Toolbar once per month, but lately it's been closer to once every three months. If your site is new, it's very possible that you will need to wait up to three months before its PageRank will appear as being above zero in the Google toolbar. You can create a custom page template for each individual category page in your link directory. After creating a custom page template for each category and uploading all of them to LinkMachine (as described here), you can select which template to use for each category, under Change Settings >> Link Categories. On this page select the name of a category, then choose which template to use for that category from the pop-down menu labelled Category Link Page Template, and click Update Template. Do this for each category that you'd like to have a customized page. The initial setup time this takes is worth it - this method allows you to place category-relevant keyword phrases in each page's title and meta tags, and even to include articles, ads, affiliate links, etc., that are specific to each individual page's category. You can have LinkMachine generate your link page(s) in any directory on your site. To do this, go to "Change Settings", "Site Settings", and set the "Location of Link Pages" to refer to the directory in which you would like the link pages to be generated. Use "../" (without the quotes) to generate your link pages in the site's root directory. Make sure that the directory you choose exists and that its write permissions are turned on. You can also change the filename of your site's main link page by changing the "Filename of Main Link Page", also on the "Site Settings" page.